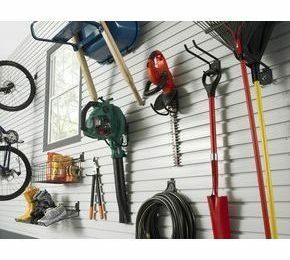 GearWall® Panels and GearTrack® Channels make it easy to get your stuff off the garage floor. Organize your home, garage and workshop with these Gladiator Gear Wall Panels (2-Pack). This slat-wall styled panel system is the foundation of the Gladiator Wall System and is designed to help you reclaim your floor by maximizing your wall storage capabilities. Customize your storage space with ease by adding these panels to bare studs or drywall finished walls. Endless storage possibilities are right at your fingertips with these versatile and easy-to-install grey finished panels. Coordinate with other Gladiator products to create a uniform look.